Thinly sliced the beef heart and cut it into squares of about 5 cm. long (approximately 2 inches). Place the pieces of beef heart in a tray or bowl. In a small bowl, blend the vinegar, black pepper, cumin, salt, garlic and aji panca until you get a soft paste. Pour the paste over the heart pieces and mix well. Cover and put it in the refrigerator for 30 minutes. 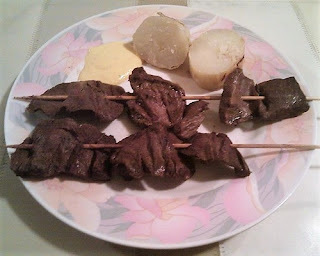 Thread the beef heart onto the skewers. 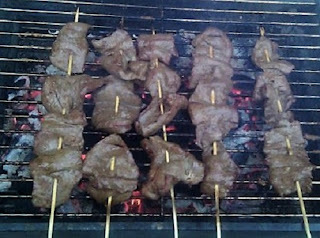 Stick three or four pieces of heart in each skewer, so that the meat lays flat. Save the rest of the marinade in a cup or small bowl and add the oil to it, use this for basting the anticuchos on the grill. Place the skewers on a hot grill rack coated with cooking spray, use a charcoal grill for best results. Grill each side for approximately 2 minutes, do not overcook. Serve hot, with slices of boiled potatoes and hot sauce. You can also add pieces of boiled corn when serving.